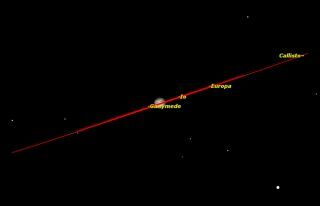 Jupiter is in the constellation Cancer and will meet up with the moon the morning of Sept. 20, 2014. Look toward the eastern sky during the predawn hours tomorrow, and, weather permitting, your eyes will immediately be drawn to the two brightest objects in the sky: the moon and Jupiter. Skywatchers awake at that early hour will see the moon (less than four days before its new phase) as a slender crescent, 13-percent illuminated by the sun. The rest of the lunar disk could even be glowing with a faint blue-gray hue. That secondary glow is called earthshine, a phenomenon caused by sunlight reflected off the Earth and then back out into space toward the moon. Jupiter, the king of the planets, is currently in the dim constellation of Cancer, the Crab, and riding to the upper right of the famous Sickle of Leo. This backwards question-mark star pattern is supposed to represent the furry mane and front legs of the celestial lion. Jupiter will rise around 3 a.m. your local time, but its rising time will be getting earlier by an average of three minutes a day so that a month from now it will rise at around 1:30 a.m. The giant planet will shine low in the east, with its four moons visible in the smallest telescope. This will provide a dramatic end to many late-night observing sessions as skywatchers get ready to move into the chilly nights of October. Jupiter won't get high enough in the sky for steady telescopic viewing until just before dawn's first light. But if you train a telescope or even steadily held binoculars on Jupiter on Saturday morning, you will see the planet flanked by the planet's Galilean moons. On one side, will be Io and Europa; on the other side, more widely separated, will be Callisto and, farthest out from Jupiter, Ganymede. Add Earth's own natural satellite, and that's five moons for the price of one! Editor's Note: If you capture an amazing view of Jupiter and the moon, or have a skywatching photo you'd like to share for a possible story or image gallery, please contact managing editor Tariq Malik at spacephotos@space.com.